Let’s start positively. It is fascinating to think that there are earth-sized planets orbiting other stars and that some of these may be of similar size to the Earth. We need to temper this enthusiasm by reminding ourselves that these planets have not actually been seen. Their position, size, mass and orbit are calculated, based on brightness measurements of the stars, considering that a planet orbiting in front of its star will slightly reduce the star’s brightness. NASA has produced some wonderful graphics – and released most of them to the public domain – showing simulations of these exoplanets. While I am thankful for the release of these pictures and grateful for the skills of the artists, I need constantly to remind us all that these graphics are not photographs. Not even the Hubble Space Telescope can take photographs of such worlds. So, the latest research suggests that the planet Kepler-186f has a stable axial tilt just as the Earth has, whereas the axial tilt of Mars is said to be unstable. 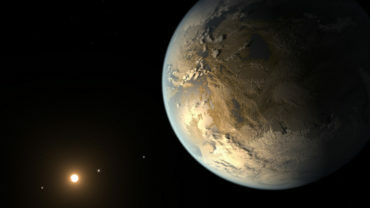 The Science Daily article that reports this suggested finding, based on computer simulations, states that this makes evolved life likely on that world. Another positive word is that at least they recognize that so many measurements concerning the Earth indicate how clearly designed for life this Earth is, but it is a leap of blind faith to suggest that a similar axial angle automatically implies life elsewhere. Astro-evolutionists are clutching at straws in space. Prayer: Thank You, Lord, that You have designed this world just right. It is You who has caused the Earth to be inhabited. Amen. Ref: Georgia Institute of Technology. “More clues that Earth-like exoplanets are indeed Earth-like: Research into spin dynamics suggests they have regular seasons and stable climates.” Science Daily, 28 June 2018. <www.sciencedaily.com/releases/2018/06/180628151708.htm>. Image: NASA Ames/JPL-Caltech/T. Pyle, Public Domain.